There are several ways to insert columns. Note: There is a limit of 12 main columns in a layer and 4 child columns within a column layer. You can use this technique to add columns or child columns anywhere. 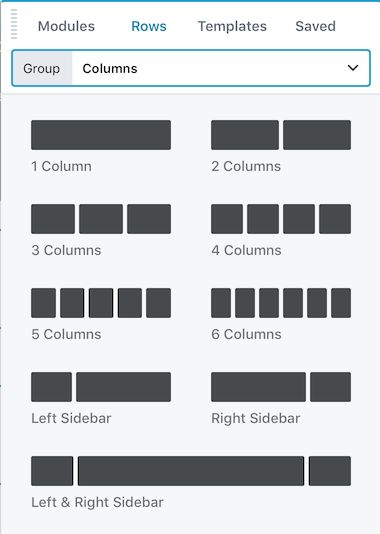 It works particularly well to construct complex column layouts before you start adding modules. Tip: If you want to add a single child column as a layer insider another column, you'll probably need to use this method. By default, when you drag a module into an existing column, it creates a module layer. See the Related Article on column layouts for more details. In the Content panel, click the Rows tab and drag the column configuration you want into the layout. Dragging a module into the layout automatically creates a new row with a column around it, or a new module layer, or a new column to the left or right of an existing one. In the following screenshot, an Icon module is being dragged in between two other columns. The blue shading shows where the new column will be inserted. Tip: You can also move and duplicate columns. See the Related Articles below.